India decided to bet on concentrated solar power (CSP) plants in January 2010 when it announced it would generate 500 megawatt (MW) of electricity using the technology under the Jawaharlal Nehru National Solar Mission. The decision was logical as the technology is clean, efficient and has more potential than the traditional photovoltaic (PV) solar power plants. 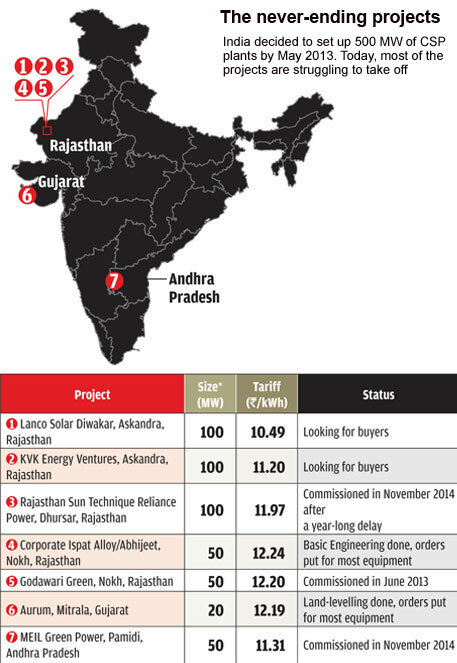 By November 2010, seven bidders were identified to set up plants with a total capacity of 470 MW. The plants were expected to get operational by May 2013. Five years later, most of the projects are facing problems (see ‘The never-ending projects’). A CSP plant is a thermal power station which uses sunlight instead of coal or gas as fuel to run turbines. In India, the technology has great potential with the Thar desert alone receiving enough sunlight (2,000 kilowatt-hours or kWh of sunlight radiation per square metre annually) to generate 2.1 million MW of energy every year. Despite the potential, the clean technology has failed to pick up because of poor planning. For starters, most projects under the Jawaharlal Nehru National Solar Mission (JNNSM) were awarded through reverse bidding process in which the lowest bidder gets the project. As a result, most of the projects were awarded to first-timers and their inexperience delayed the commissioning of most plants by over a year. “Reverse bidding brought forth the aggressive winning bids but not the viable bids in the allocation,” says Lavleen Singal of ACIRA, one of the developers that did not win the bid. The other impediment was financing the projects. The capital cost of a CSP plant is Rs 12 crore per MW, as per the Central Electricity Regulatory Commission (CERC) guidelines for 2015-16 (see ‘An expensive affair’). In contrast, PVs are substantially cheaper. CERC, recognising this capital cost disparity, puts the ceiling price for power generation through CSP plants at Rs 12.05 per kWh and for PV plants at Rs 6.86 per kWh. As a result, banks are reluctant to provide financing. 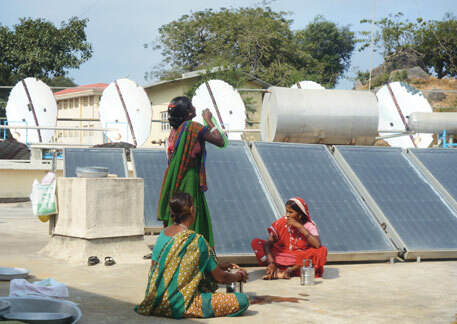 Investors are also sceptical about CSP plants in India because little local research is done on the technology. The Centre decided to announce the setting up of CSP plants but did not bother to run pilot projects to assess the feasibility. “Since there was no successful pilot project, bankers and investors were unsure of the technology. This made securing finance difficult,” says Rajiv RanjanJha, general manager of public financial institution Power Finance Corporation. Bankers generally require projected electricity generation data for the next 10 years from the developers to give loan, but the Centre’s decision not to record Direct Natural Irradiance (DNI is the amount of solar radiation received per unit area by a surface) added to the confusion. As a result, developers relied on data produced by NASA, which experts say is old and misleading. “Ideally, a developer would install a data collecting station at the site of the plant, collect the data for at least a year or two and then forecast the DNI data to estimate the generation figures. DNI data from the site is one of the most important factors for any developer,” says Shiv Shukla, president, business development-India & NC, Abengoa, one of the international developers that bid for the plants. J S Solanki, general manager of Godawari Green project, says, “At the time of allocation, DNI that was considered, based on NASA estimates, was 1,825 kWh/ m2/year, but the site actually received 1,753 kWh/m2/year.” This affected the project significantly. Industry players also complain of land shortage. 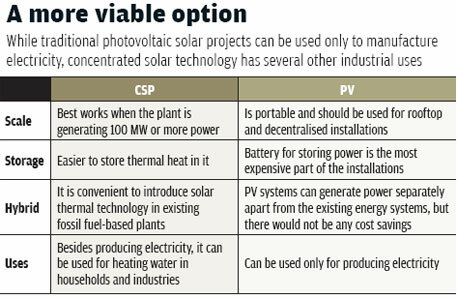 “Land allocated to large-scale PV plants should be provided to CSP. PV technology is portable and can be set up on rooftops. Barren land should instead be given to CSP,” says Vimal Kumar, president (projects), Cargo Power & Infrastructure. Kumar’s organisation is in charge of a 25 MW parabolic trough CSP plant with nine-hour storage that is located in Kutch, Gujarat. Rajasthan has allocated unused desert land for PV projects. The impact of the Centre’s reluctance to carry out proper background research can be seen in the way it plans to provide water to the projects. In water-starved Rajasthan, project developers were assured water availability through Indira Gandhi Nahar Project canal. The scheme earmarked 11.92 cubic feet water per second for 400 MW of CSP installations. This much water is sufficient to power 1,200 MW of CSP projects. The Centre has enough reasons to push for the technology. The Intergovernmental Panel on Climate Change 2010’s special report on renewable energy says, “CSP emits fewer greenhouse gases over its life cycle as compared to PV and wind”. The other advantage is that unlike PV that can be used only for manufacturing electricity, concentrated solar technology can also be used for heating water. According to estimates, an individual household can save as much as 1,000 to 1,500 units of electricity a year if they use the technology to heat water. Assuming that a unit of power costs Rs 5 per unit, a household can save Rs 6,250 every year with the technology. This means the initial cost of the heater, which is around Rs 15,000, can be realised in just three years. The technology can also be used in several industries including iron and steel, paper and pulp, textile, ceramic and tile, food processing and dairy. It is estimated that over 15 million tonnes of fuel oil is consumed annually in these industries for heating and concentrated solar technology can be used there. “There is a potential of 100 per cent fuel replacement in pulping, paper drying and pulp bleaching in the textile industry,” ShirishGarud of TERI said at the Global Renewable Energy Forum in Brazil. There is also a case for pushing the technology in water-stressed areas. International Energy Agency (IEA) estimates CSP technologies need water up to 2-3 cubic metres per MWh of electricity generation. Comparing these estimates with actual figures achieved on ground, we find that ACME Solar in Bikaner, Rajasthan, produced 7 MWh by utilising 20 cubic metre of water per MWh per day which means 2.85 cubic metre of water per MWh. If we look at thermal power plants, according to Central Electricity Authority (CEA), a typical 2x500 MW coal-based plant uses 4,000 cubic metres of water per hour, mainly for ash disposal and cooling which translates into 3.5–4.0 cubic meters of water per MWh. This means water consumption of CSP plants is comparatively lesser as compared to that of coal-based thermal power plants. While India was quick to announce CSP projects, China decided to go slow. 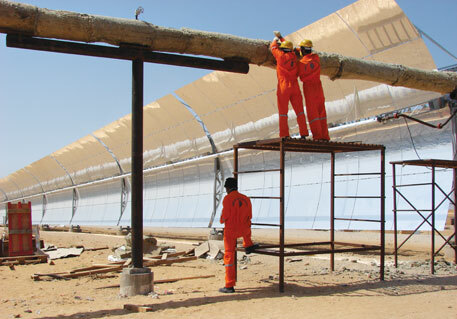 The country announced its solar commitment to develop a capacity of 3 GW by 2015 and 10 GW by 2020. Its advantage is that domestic players are already manufacturing equipment for the PV market. This has resulted in drastic reduction in input cost for CSP plants. “Cost reduction in any industry happens when the manufacturing of components and sub-components moves to the east, India and China primarily,” says Ashvini Kumar, director, Solar Energy Corporation of India (SECI). Sunny Sun, director (solar) at CSP Focus, a private player in the industry, says, “China is going slow in deploying CSP. They did background research. Its emphasis is on resource survey, site selection, developing a roadmap based on pilot and demonstration/scale development/commercial deployment route.” Before announcing the feed-in tariffs, the priority for the Chinese government was developing support manufacturing industry -mirrors, heliostat, receiver, storage and transfer medium, receiver tubes, and many other components and sub-components. Many private companies set up pilot projects with support from the government. China also offers cheap loans to its developers. And while China has decided to first prepare the groundwork for the technology, India believes announcing new projects is the logical way forward. This explains why the Centre has not tried to revive the exising projects and has instead announced two new projects. Kumar said at the CSP Focus India 2014 conference in New Delhi that “the tender for engineering, procurement and construction contract for only two pilot projects, both to be owned by SECI, of 50 MW each... would be out later in the year”. However, the tenders for the two projects that are proposed to come up in Charanka Solar Park, Gujarat, and Jaisalmer, Rajasthan are yet to be announced. Tarun Kapoor, joint secretary, Ministry of New and Renewable Energy, says, “The levelised cost of energy for the pilot projects is aimed at Rs 6.25 per unit of power generated.” He adds that if the cost per energy becomes less than Rs 8 per unit, the market would be flooded with new installations. Instead of announcing additional projects, the government should focus on improving data. Delhi non-profit Centre for Science and Environment says that the Centre for Wind Energy Technology (CWET) should measure the DNI for two years for each solar radiation resource assessment (SRRA) stations and then compare it with five years of satellite data to evaluate DNI for a particular location. This would allow the policy-makers to tweak the projects for different states. The non-profit also says that till the time CSP projects become lucrative, the ministry should promote solar thermal applications for industries and create a steady demand for thermal applications. Additionally, the Centre must encourage local manufacturing of reflective mirror, structures and thermal storage with the objective of not just reducing the input cost but translating India into a manufacturing hub. Players should also move towards hybridisation at thermal plants that are already using coal, gas or biomass. The Centre should also work towards putting the existing projects on track by penalising defaulters. For repeated defaulters, the government should encash the bank guarantees. It should also re-auction the projects that have not started. Solar thermal has tremendous potential along with many applications. It is more efficient to use the heat of the sun directly instead of converting the heat into electricity and then using for heating purposes. Especially for a country like India which favours centralised solutions for generating electricity, CSP makes more sense than PV. Unfortunately, in the rush to embrace CSP, the country missed many steps. India should first focus on solar thermal applications and make sure that every household, commercial establishment and institution has a solar water heater. This will develop the manufacturing sector. It should also focus on popularising hybrid power plants by introducing CSP at thermal plants that use fossil fuel. These steps will not only make the technology popular, but also economical, which, say experts, is one of the primary reasons for its failure in the country. There is a general saying for high efficiency the system should be mostly of ideal functioning. Look at the harsh atmosphere of Rajasthan where large Solar Activity is on(as if India has no other better solar sites). Rajasthan experiences sand storms LOO and water availability to clean the panels is less. Ã”Ã‡Ã³	Solar photovoltaic (PV) directly converts solar energy into electricity using a PV cell made of a semiconductor material. Ã”Ã‡Ã³	Concentrating solar power (CSP) devices concentrate energy from the sunÃ”Ã‡Ã–s rays to heat a receiver to high temperatures. This heat is transformed first into mechanical energy (by turbines or other engines) and then into electricity Ã”Ã‡Ã´ solar thermal electricity (STE). Over the period 2000Ã”Ã‡Ã‰11, solar PV was the fastestÃ”Ã‡Ã‰growing renewable power technology worldwide. Cumulative installed capacity of solar PV reached roughly 65 gigawatts at the end of 2011, up from only 1.5 GW in 2000. In 2011, Germany and Italy accounted for over half the global cumulative capacity, followed by Japan, Spain, the United States and China. Concentrated solar power is a reÃ”Ã‡Ã‰emerging market. Roughly 350 megawatts (MW) of commercial plants were built in California in the 1980s; activity started again in 2006 in the United States, and Spain. At present, these two countries are the only ones with significant CSP capacity, with respectively about 1 GW and 500 MW installed, and more under construction or development.,IEA. (International Energy Agency). In the last three years, however, the economics have turned decidedly in favor of PV technology. A glut of PV panels, made mostly in China, has pushed their prices down 62 percent since IvanpahÃ”Ã‡Ã–s construction began in 2010, sinking from $1.87 per watt to about 71â”¬Ã³. While at least three other concentrating solar plants are set to join Ivanpah by 2016, many others are being converted to PV or canceled. Ã”Ã‡Â£Right now, PV is the favored technology,Ã”Ã‡Ã˜ says Ben Kallo, an energy technology analyst with Robert W. Baird, a Milwaukee-based investment bank(Renewables Solar Energy Shakeout: Concentrating vs. Photovoltaic Ken Wells and Mark Chediak November 14, 2013, Bloomberg Business). The World's Biggest CSP Project DESERTEC which has been disbanded should act as an eye opener before starting large scale CSP projects in dusty and desert regions in India. "Small, decentralised and reversible overrides large and centralised. If one persists with the claim that growth should be designed to be intelligent and environmentally friendly, a question comes up: who decides what is intelligent? Proponents of nuclear power, for example, once thought they had found the key to a clean source of energy that could be tapped into forever. What remains is only the emergency: what to do about the future ruins of nuclear plants and their waste? What technology will prevail and what will be pushed the way of the dinosaurs by newer technology will be never predictable. In his book The Third Industrial Revolution, sociologist Jeremy Rifkin claims that the potential of solar energy based on decentralisation is revolutionary. Everyone can be an energy producer from his own house, he writes. Soon there should be opportunities to put solar panels on roof tiles or in the plaster of houses as standard fittings. And then who will need power that has to be transmitted across continents? Small, decentralised projects not only have the advantage of being easier to adapt to changing circumstances: they can be also the germ cells of innovation and tests for acceptance. Big visions spin off small projects and ideas. The Ã”Ã©Â¼400bn plan was launched to bring electricity from the Sahara to Europe, and now there are only power plants in Africa. A disaster? Hardly for the people there, who benefit from it. Sometimes the big picture is needed to have a goal worth striving for. If the path is split up into small, manageable steps, that can even be an advantage. Who calls for a ban on traffic may gain at least 30kph zones. Sometimes, radical thinking is necessary. Most of the time, people act pragmaticallyÃ”Ã‡Ã˜. RENEWABLE ENERGY:The lessons of Desertec, 24 July 2013, Sâ”œÂ£DDEUTSCHE ZEITUNG MUNICH, VOXEUROP).